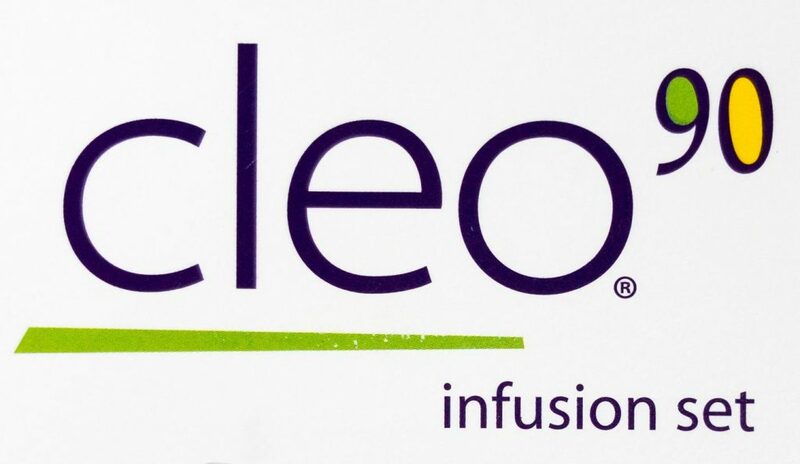 Cleo 90 infusion set - forgotten but not gone? 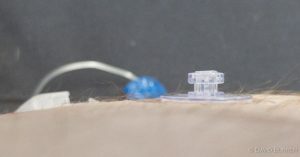 The Cleo 90 is an infusion set for insulin pumps which is available through Australia’s NDSS, but seems to have been forgotten by many people. 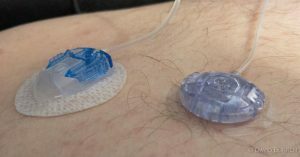 Since 2010 I’ve used a variety of infusion sets with my pumps. 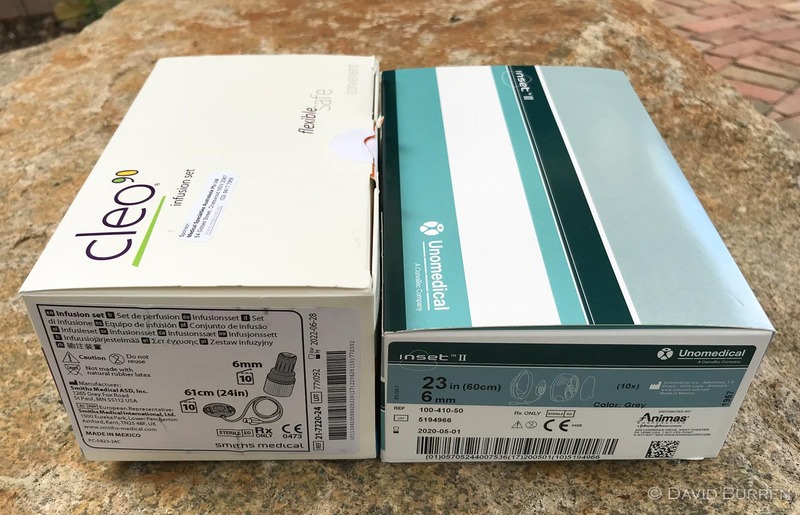 The Animas Inset II (and the equivalent Medtronic Mio) and the Animas Comfort (and the matching Medtronic Silhouette). I started out being shown by my DE how to use the Inset II on my Animas pumps, and after many years I branched out and learnt how to use the Comfort set (it’s manually inserted, but takes up a lot less space when packing for travel). When I switched to Medtronic pumps for a while I was able to use the Mio and Silhouette sets which are the same things just with Medtronic connectors. An overview of all the infusion sets available in Australia can be found in another post here. 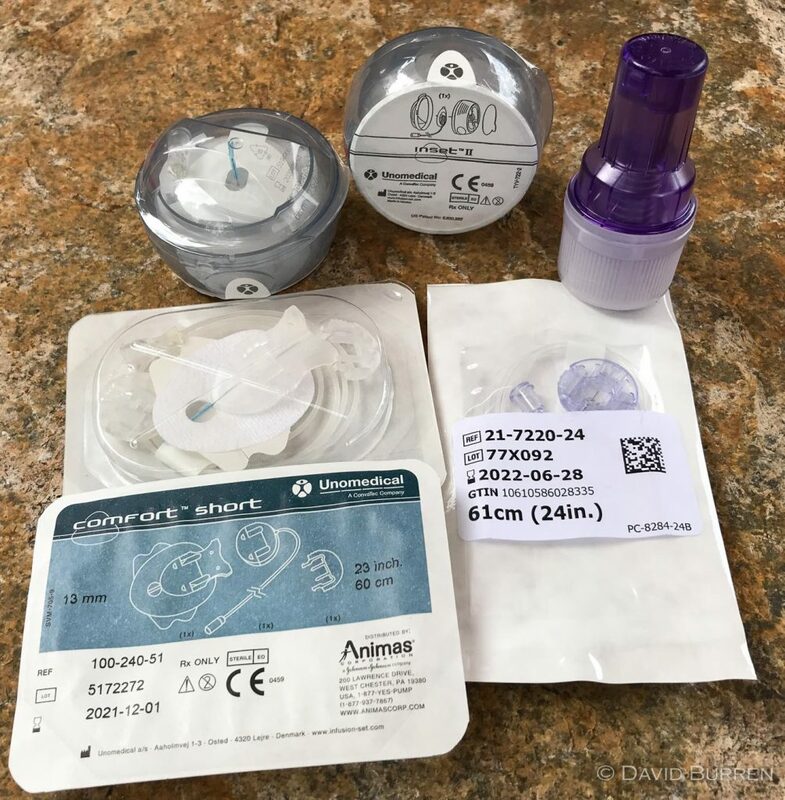 Now I’m switching to the Accu-Chek Spirit Combo I’m back to using sets with luer-lock connectors (as used on the Animas pumps) so I was initially just going to switch back to the Inset II and Comfort sets. But now I’ve found another option as well. 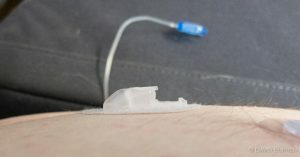 This infusion set has a luer-lock connector, so can be used with the Animas Vibe and the Accu-Chek Spirit Combo. 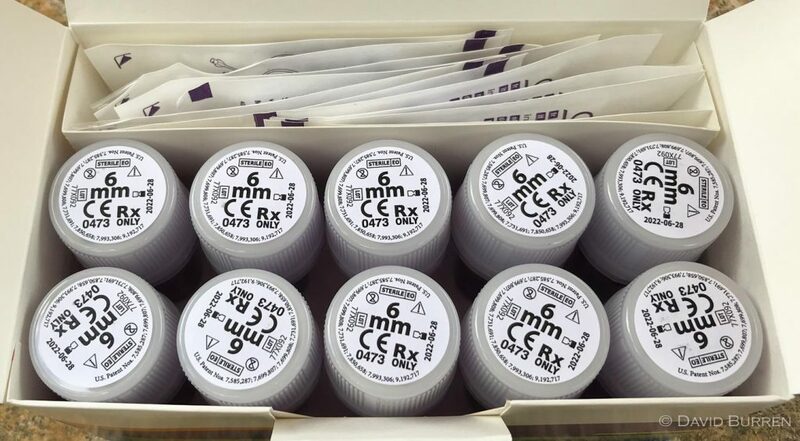 It’s available with 6 mm or 9 mm teflon cannulas, and tubing lengths of either 61, 79, or 107 cm. I’m using the 6 mm, 61 cm version. The Cleo 90 infusion set is made by Smiths Medical, and has been available in Australia for years through NDSS and your pharmacy. It’s supported in Australia by Medical Specialities Australasia (MSA) who also supplied the Cozmo pump which was another Smiths Medical product. That pump was discontinued around 2009, although consumables for it have since been available through NDSS for many years (including pump reservoirs up until August 2017). It seems many people assumed that the Cleo 90 went away at the same time as the Cozmo, but it’s still around. Today MSA are supplying and supporting the Cellnovo insulin pump, but they reassure me the Cleo infusion set is also here to stay. Having reviewed the infusion set options recently, I noticed the Cleo 90 was available, and that according to its specs it had the finest cannula/needle (28G) of all the available teflon sets. So I decided to get a box and give it a try. Trying a new infusion set type shouldn’t be challenging, as long as you do your research and follow the instructions (at least at first). 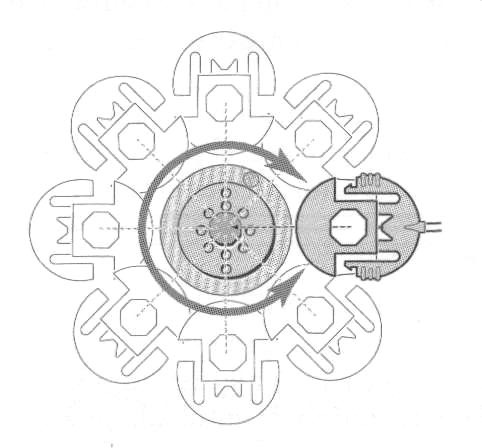 The connection to the pump works the same as all the other luer-lock sets, and the different piece is the connection to your body. Ordering the box of sets was easy: I just selected a different product when placing an NDSS order through my pharmacy. You can see the list of Insulin Pump Consumables on the NDSS website. We’re very lucky in Australia: in countries like the US or the UK you would need a prescription for the specific consumables you wanted to use. In terms of overall size, the box isn’t all that much different from the Inset II box. When you open it up it’s quite a different layout though! As you can see, the cannulae (each with their own applicator) and the tubing sets are packaged separately. For size comparisons, here’s a Cleo set (on the right) alongside two Inset II sets and two Comfort sets. For a long time the Comfort sets (exactly the same as the Accu-Chek TenderLink) have been my “small for travel” sets, while the Inset II has been my regular set when at home. The Cleo might be able to serve in both roles. Because of their domed top, the Inset II (and especially the Medtronic Mio version which has an even-more pronounced dome) often doesn’t pack neatly into luggage when you need a lot for an extended trip, but with this size comparison I think these will be a lot more efficient. How neat and tidy they are is one thing, but how easy they are to apply, how comfortable they are to wear: those are probably more important. That’s a reasonable overview of the process, although I haven’t used Skin-Tac. One detail it doesn’t quite show is the structure of the attachment between the tubing and the cannula. The centre post of the cannula is octagonal, and you can attach and re-attach it in any of eight directions, as shown in this diagram from the instruction booklet in the box. Here you can see the first test I did (applying the cannula to Splash the AMSL penguin). You can see a little circle on the lower left edge (slightly dark in this image). This is an area with less adhesive, designed to provide you with a way of removing the cannula. Pick away at that edge until you can get your fingernail under that, and then peel it off. Here you can see that spot on the underside of the adhesive before it was applied. When applying a cannula on my abdomen I try to remember to position that spot facing away from the direction of my navel. That way when removing the cannula, by pulling in the same direction as the hair growth it minimises the depilatory effect. This is a trick I learnt with the other cannula types, but because the Cleo is circular I forgot to check that detail when I applied my first one! Applying the set just requires finding a location and pushing the applicator onto your skin. It’s that simple. 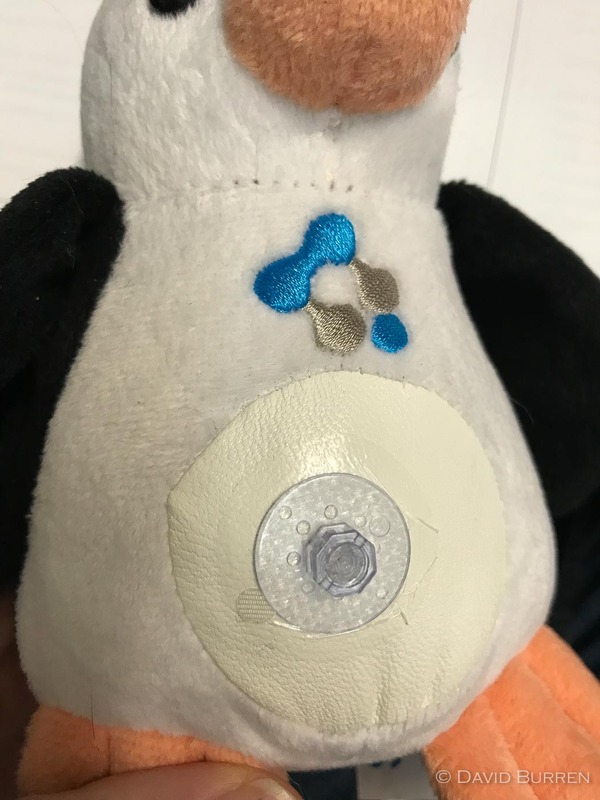 The process applies the adhesive, then when you push down on it (ideally a single quick and steady motion) it pushes the needle and cannula through your skin. When you reach the bottom a catch is released and the needle is withdrawn into the applicator by a spring. Then continued pressure downwards just helps the adhesive take hold. But it will be important to not wimp out part-way: to push the needle in all in one motion. The only step left to do is remove the applicator from your body (hopefully without pulling the cannula away). On my first attempt the adhesive lifted slightly around the edges, but the cannula stayed put and the adhesive quickly stuck down again after the applicator was removed. On my second cannula I tilted the applicator away, one side stayed stuck to my skin, and then I rolled the applicator around as suggested in the above video. Easy! Once the tubing set has been attached to the cannula, the housing is quite low-profile. Here it is beside a Medtronic Mio set (which at this end is exactly the same as an Inset II). 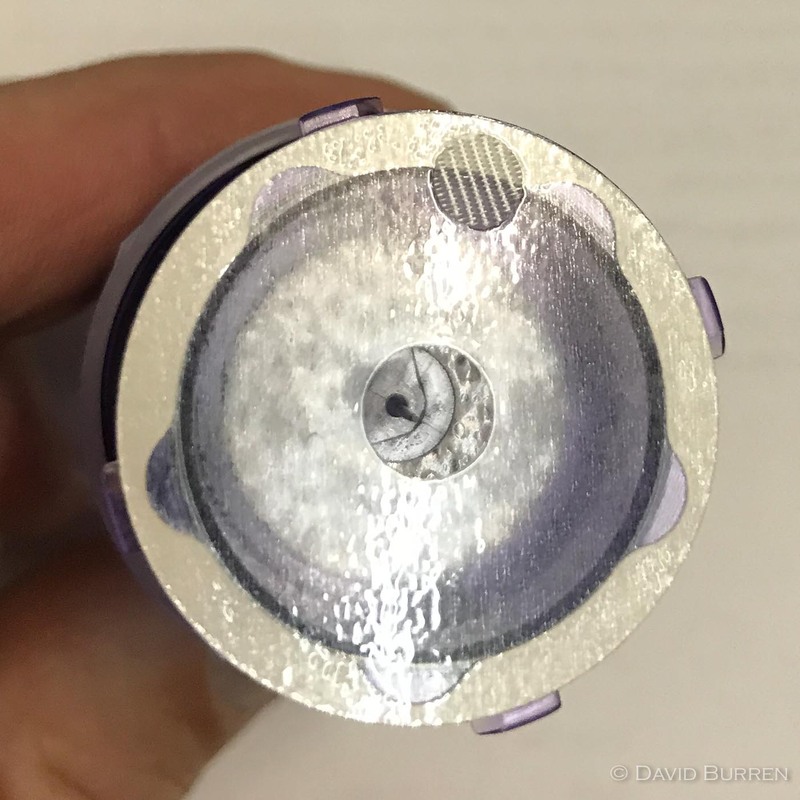 By the time you remove the purple applicator from your body, the needle has been retracted deep within the housing by a spring and is quite safe. Even when I pressed down on the spring action again it wouldn’t travel far enough to expose the needle. I did remove the needle from one used applicator in order to measure its gauge (28G, as advertised) but doing that required destroying the very solid purple device. It’s obviously designed to be safe. I’m pretty happy with the Cleo 90 sets so far. I’m going to continue using them and see what further details I notice, but it’s good to know there are options out there. I’ll publish an update before I run the first box through. If you use an Animas Vibe or Accu-Chek Spirit Combo pump, you have quite a few cannula types to choose from (anything with a luer-lock connection). They each have their advantages, and you might find that the Cleo 90 suits you. I like to have access to more than one cannula type as it gives me confidence in having options if there’s ever a supply problem, as well as being able to simply have choices. If you’d like to try the Cleo 90, you could of course just go ahead and do it, but I’m sure your diabetes educator would be happy to help you if you want to check it over with them. Just to be clear: I have no association with or interest in Smiths Medical or MSA. I love the Cleo infusion set. 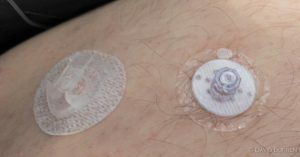 The adhesive on the race is closer to the clear material on an IV one hand, not the paper like tape on standard infusion sets ( which I hate ). Trouble is, I have a tandem X2 pump, they went the proprietary road with a different T-Lock connection as opposed tothe standard Luer lock. This means i can only use Tandem’s infusion sets GRRRRRRRRRRR. I like Cleo a WHOLE LOT better than anything Tandem has put out there. 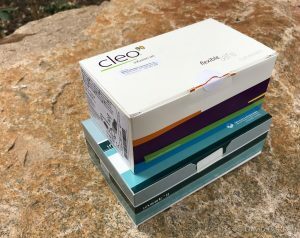 Hey there – so glad to see someone else who knows about the Cleo 90 (and I received some samples from Diabetes Depot a few years ago ( great video from them above ). I’ve met Tino (who is now semi-retired) as the Pharmacist there – a few times at Canadian events – he’s like myself – long in the tooth T1D. Anyhow, I finally have gotten around to giving it a go, and very VERY easy to apply. I’m not a big lover of a plastic cannula due to earlier probs with the width of the cannula as well as slight teflon reaction, but these ones compared to the Contact D I use (I’m still using my Animas Vibe or gifted Ping from a t:slim user – I’ll continue until they die and/or I run out of cartridges since they’ll eventually be like looking for gold ). My only dislike is that the packaging surrounding the applicator cannot be recycled. Isn’t that the worst part of pumping??? I was using the Mio version for Animas for awhile, and I just would remove the sharp, and then place the rest in my blue bin. That’s the only downside of the Cleo. Cheerio for now!! I’m packing a carry on for a 3 week EU trip that involves meet ups with T1D’s along the way – as well as some R&R. Have insulin will travel !!! Whoo! Whoo!